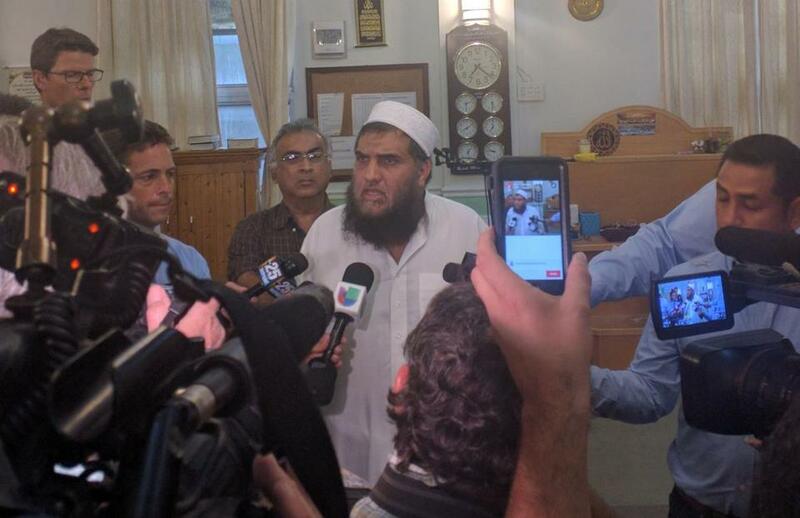 Syed Shafeeq Rahman, imam of the Fort Pierce, Fla., mosque that Omar Mateen attended, spoke to the media Sunday. WASHINGTON — The FBI let the Orlando mass-shooting suspect slip through its grasp despite interviewing him twice since 2013 due to a lack of evidence to hold him, a troubling fact that will pressure officials struggling to detect lone terrorists without eroding basic civil liberties. The FBI is investigating Sunday’s killing spree at a gay dance club in Orlando, Fla., as an act of terrorism after 29-year-old shooting suspect Omar Mateen killed 49 people using an assault weapon and a handgun. Mateen, who called 911 as he began the assault to claim allegiance to Islamic State, was killed in a shootout with police. While the US has made progress in countering groups like Islamic State on the ground overseas, technology allows their radical ideology to reach across borders and lure true believers, the socially disaffected or the mentally unstable. Even when a potential terrorism suspect comes to the attention of US law enforcement — as Mateen did — there may not be enough evidence, resources or coordination to continue an investigation. “Those interviews turned out to be inconclusive, so there was nothing to keep the investigation going,” Ronald Hopper, an FBI assistant special agent in charge of the bureau’s Orlando office, told reporters. Senior US national security officials, including Federal Bureau of Investigation Director James Comey, have warned for several years about the threat from “lone-wolf” terrorists — those who become self-radicalized and plot attacks with little notice or resources. “The step from just having some extreme views to acting violently is extremely hard to detect from the outside unless that individual is sharing that with others on social media, telephonically, or what have you,” said Daniel Benjamin, director of the Dickey Center at Dartmouth College and a former State Department counterterrorism coordinator. That effort is compounded in a country like the US, where free speech and the ability to buy guns are considered fundamental rights. “Just making statements isn’t enough to arrest somebody,” US Senator Marco Rubio, a Florida Republican and a member of the Senate Intelligence Committee, said on CBS News. “The ominous feeling today is that while lone-wolf operators may 99 percent of the time not be capable of complex, high-end attacks on their own, we’ve been reminded of how much damage an assault weapon can do,” said Benjamin. Officials say it is too early to determine what, if any, actual link Mateen had with Islamic State, despite his 911 call and the group’s announcement claiming credit for the assault. Even as Islamic State has lost territory in Syria, Iraq, and Libya, individuals connected or inspired by the group have carried out successful attacks in the past year in Paris, Brussels, San Bernardino — and now, perhaps, Orlando. US Representative Adam Schiff of California, the top Democrat on the House intelligence committee, said in a statement that Islamic State leaders have been urging attacks during the Muslim holy period of Ramadan, which started this month. It’s also LGBT Pride month in the US, raising additional questions about the attack as a hate crime against the club’s gay clientele. “The overwhelming numbers and the somewhat limited resources of the FBI do not allow them to track everybody all the time,” Henry said. Early on, Islamic State was viewed as less of a direct threat to the US and Europe than other groups such as Al Qaeda because it was focused on seizing territory for its claimed caliphate. But Islamic State should be seen as both an insurgency that is struggling to hold on to its territory and as a global terrorist organization that is recording successes, said Charlie Winter, a senior research associate at Georgia State University who studies transnational jihadist movements and insurgencies. In terms of its ability to inspire attacks, the Islamic State “looks more powerful than it has before,” Winter said in a phone interview from Atlanta. Coordination between the FBI and local police about suspects should have been learned from the Boston Marathon bombing in 2013, King said. Tamerlan Tsarnaev came to the attention of the FBI before the attack, but that case was also closed and the information wasn’t shared with local authorities, King said. Stopping lone-wolf attacks in the US is “extremely difficult” because law enforcement and intelligence officials are limited by laws in terms of how much internet surveillance they can do of suspects, as well as by the resources they have, King said. Correction: Authorities revised the death total in the massacre, from 50 to 49, on Monday morning.